Sometimes you have to just be lucky to win a race. 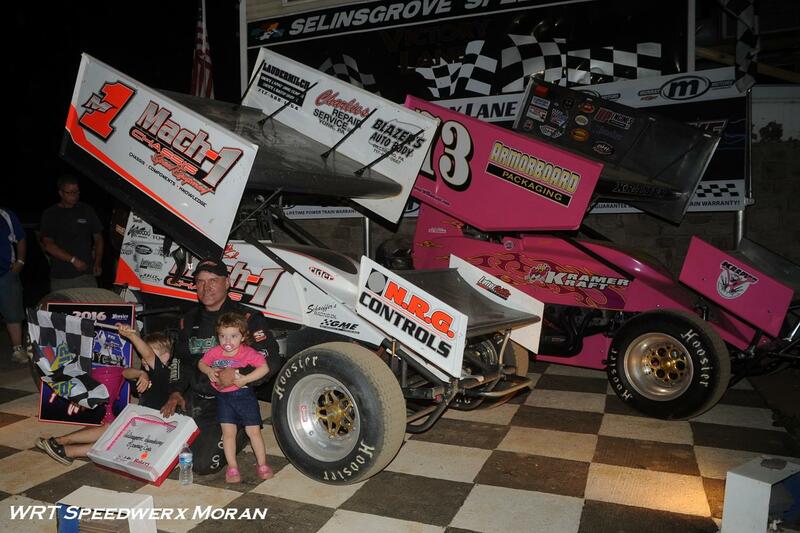 Saturday night Mark Smith's luck helped him to victory lane at the Annual Kramer Cup race at Selinsgrove Speedway. Eric Tomecek had the field covered but an unlucky incident with the turn 4 wall with 2 laps to go handed Smith the coveted Kramer Cup Victory. A field of 33 360 sprint cars were in the pits at the Annual Kramer Cup event held in honor of the late Kramer Williamson. With 4 heat races on tap, winners of the heat and $73 dollars went to Josh Weller, Robbie Stillwaggon, TJ Stutts and Mark Smith. The B-Main was won by Nate Synder and when heat #1 winner Josh Weller pulled the 8 pill, that put Tomecek and the B&G Auto Body #22 of Troy Betts on the front row. The invert also buried the top 3 in URC points, Davie Franek 14th starting position, Robbie Stillwaggon 7th starting position and Curt Michael 12th starting position. From the drop of the green flag Tomecek was fast, hitting lapped traffic by lap 5 and building a 3.9 second advantage over 2nd place runner TJ Stutts. A lap 16 caution for the 21 of Ed Aikin erased Tomecek's lead and bunched up the field. A lap 17 restarted saw the 33w of Michael Walter II flipping down the front stretch. After a quick red flag fuel stop, the top 5 was Tomecek, TJ Stutts, Mark Smith, Troy Betts and Jason Schultz. Since no lap was scored a single file restart with Tomecek once again taking a commanding lead. The field raced just 2 laps before the most of the field had to take evasive action down the front stretch to avoid a slowed 39 of Eric Parker. On the restart, Mark Smith jumped all over Tomecek and took the lead heading down the backstretch, unfortunately they yellow was thrown before a lap could be completed, putting Tomecek back to P1 and creating another single file restart. On the restart Tomecek again checked out on the field, unfortunately the next caution flag was thrown for the 1 of Tomecek who had stopped in turn 4 after hitting the wall and ending his night. Tomecek who had built a 2 second lead at the time of his wreck could only watch the remaining 2 laps from the pits. On the restart Smith jumped out to the lead with the Victory Auto Glass, Schearer's VW and Audi Specialists #63 of Josh Weller had a great start rocketing himself from his 3rd place starting position to the now runners up spot. Unfortunately the flagman didn't like the start and it was called back with the field now starting single file again. Smith would go on to lead the final 2 laps taking home the coveted pink Kramer Cup along with a heafty $2,573 top prize money. The teams of the United Racing Club will now only have a few hours to wash and maintenence the cars before heading to night #2 of the Memorial Day Weekend at Port Royal Speedway. Saturday nights race is sponsored by Quality Auto Body of Burlington NJ and an increased purse thanks to Greencastle Livestock Market, LLC. DNQ: #67 Justin Whittall, #74 JR Berry, #73B Brett Michalski, #44 John Braim, #28 Keith Prutzman, #3z Colby Wormer, #67c Jason Cherry, #99 Cody Keller, #706 Mark Sasso, #77 Derek Locke.